Mordian 7th Regiment: Heresy Era Sons of Horus - Reaver attack squad complete! Heresy Era Sons of Horus - Reaver attack squad complete! After a longer-than-expected stretch of home repair that put the hobby loft out of commission for quite a few days, I was finally able to get the painting servitor plugged back into its socket and fired it up! First up was to finish off the Reaver Attack Squad for the Sons of Horus. I really enjoyed building and painting this unit, and look forward to seeing how they perform on the tabletop - They certainly aren't cheap points-wise though, with everyone toting a power sword or power fist, they weigh in at 375 points! As much as I like the resin chainaxes they come with by default, they're rather thin and bendy and I feared much breakage. Instead I rooted through the leftover bits from all the Betrayal at Calth boxes I've picked up and had enough plastic Mk.IV power swords to kit out the unit. Should be far more robust when it comes to transporting 'em! Really pleased with the MaxMini jump packs, I think they suit the aesthetic really well and give the models a rather brutal look. Doesn't hurt that it gives them the Bulky rule, and therefore means they each count as two models when it comes time to figure their Merciless Fighters attacks. At initiative step 1 any surviving model with a power sword gets additional attacks - hard to go wrong there! 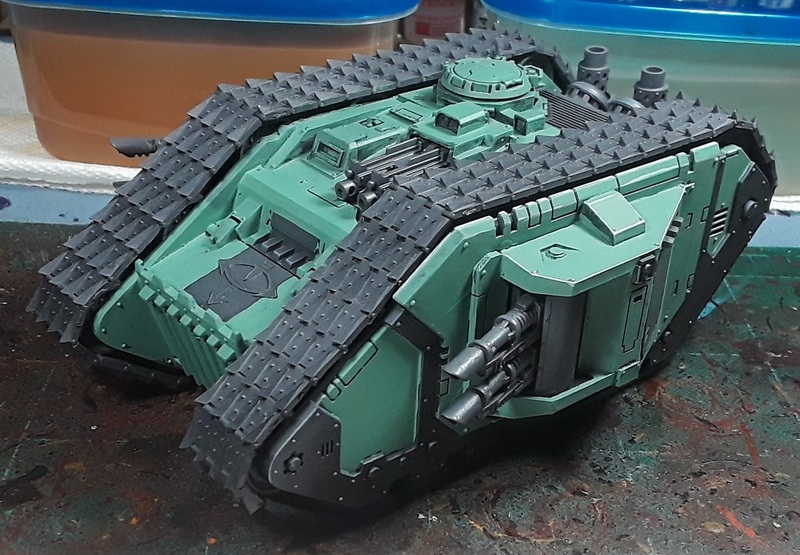 Once they were done I couldn't help but press on with the first of the trio of Land Raiders. Laid in the initial black and green and have started the edge-highlighting process. Still a ways to go of course but liking how it's coming along so far! Lovely green colour and great work on the squad and LR, look awesome and evil. Looking very well, but the sculpt on the Reavers sarges head looks a bit odd. Loving the look of the raider. I like the sarge! He looks maniacal! That reaver squad is a thousand points of kool. Who cares if they ever make their points back ? Just putting them on the table means you won, even if you get tabled. Jus' my opinion, you understand. Nice, but aren't reavers black? @Zab: Indeed! I've really been enjoying using it though, it's a great color! @Zzzzzz: I'm looking forward to getting them on the table and see what they can do!